Open Chargeport - Clicking this control Opens or Closes (if motorized port is installed) the charging port. Start Charging - Clicking this control Starts or Stops a charging session for the currently selected car. Set Charge Limit - Clicking this control enables setting the battery charge limit. Use the slider or preset charge level buttons to set the desired limit. This indicates whether the car is currently charging. Note: If super-charging is detected that will be indicated. If the vehicle is currently charging an estimate of the charge time remaining is displayed. If scheduled charging is set for the current location the next charge start time will be displayed. This displays whether the charge port is current Open or Closed. This displays the projected range remaining in either mi or km. 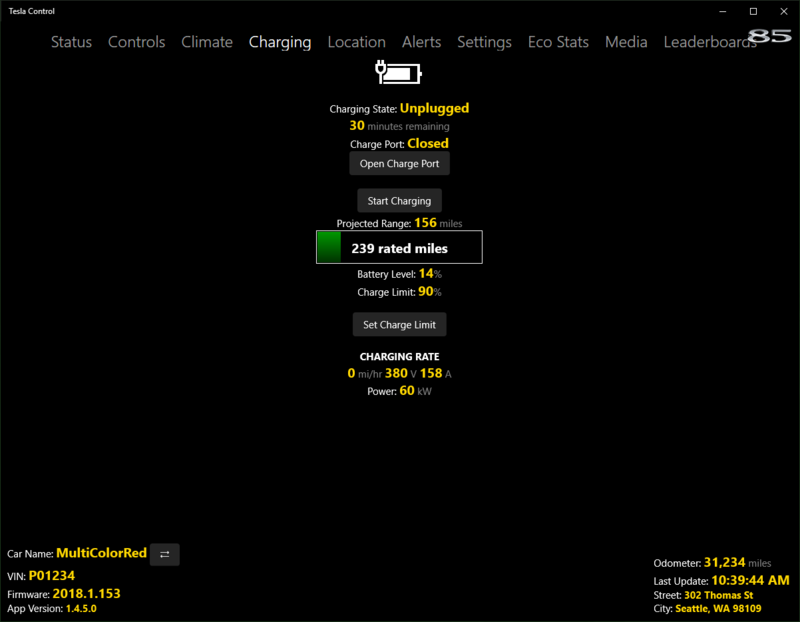 The green bar and text indicates the current battery level reported by Tesla servers for the vehicle as well as either the Rated range (Typical in Europe) or Ideal range (Rated in Europe). This displays the current battery level in percent. This displays the current charge limit setting in percent. If the car is charging this displays the current charge rate in either mi/hr or km/hr. The current charging voltage, current and power are also displayed.